Sculpture Park in Denver, Colorado. One of those locations was Sculpture park in Downtown Denver. Having seen the Sculpture park on Google Maps while looking for restaurants near our hotel, a friend and I decided to check it out. Below are some images I captured at the park with the various equipment I had with me. Below are two 360 degree panoramic images I captured with my Google Pixel XL mobile phone. Images were captured with the Pixel camera in panorama mode and then I ran the actions I created in Photoshop. The images below I captured with the Samsung Gear 360 camera. Since I was holding the camera and the horizon was not corrected by the camera, I had to use software called Hugin to fix the horizon of the panoramas. After I corrected the horizon of the images, I ran them through the various action I created in Photoshop. Early the next morning, something around 2:30 and 3 am I went back out to the park to photograph the statues when they would be lite by the ground lights. 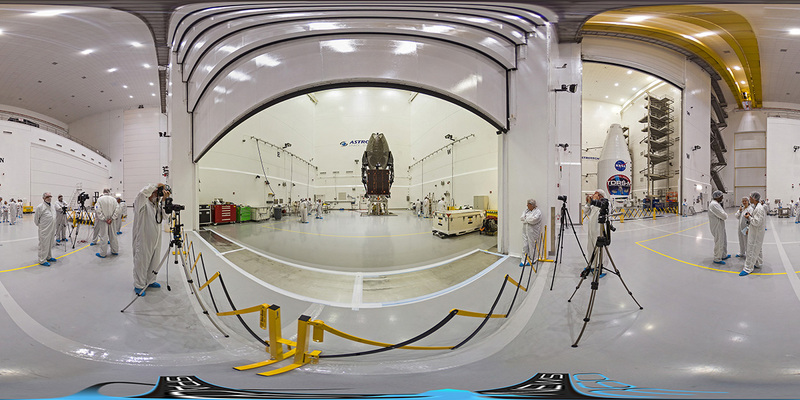 You can view the two spherical panoramic images below. Also that night I photographed two other sculptures by an artist called Fernando Botero. 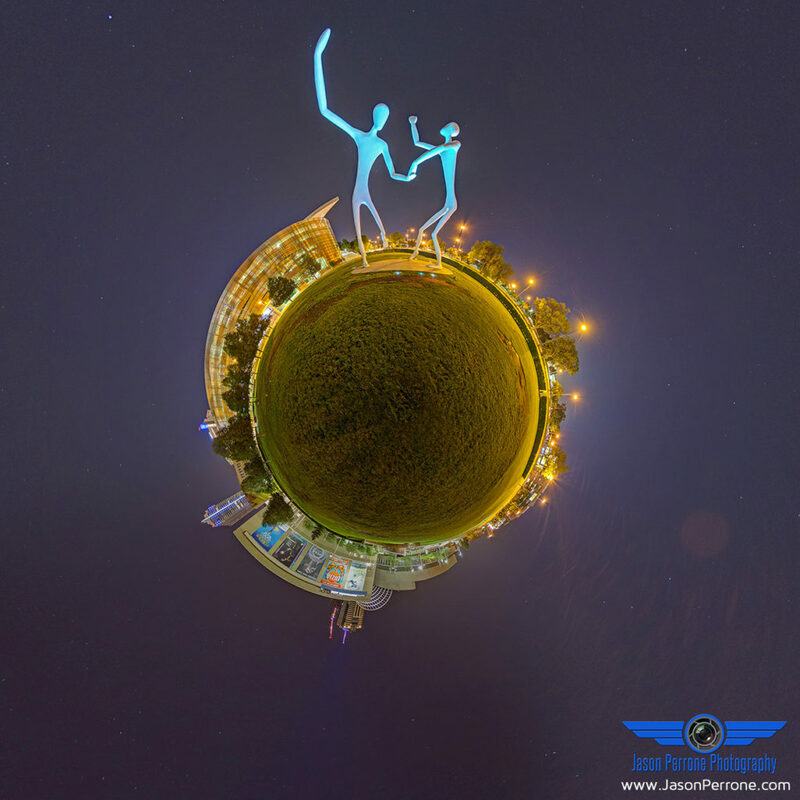 Click the Play button below to view the two 360 degree VR panorama images of “The Dancers” sculpture lite up at night. Photo of “The Dancers” sculpture at the Sculpture Park in Downtown Denver, Colorado. Tiny planet projection of “The Dancers” sculpture at the Sculpture Park in Denver, Colorado. The Sculpture Park is a unique outdoor venue in the heart of the Denver Theatre District. 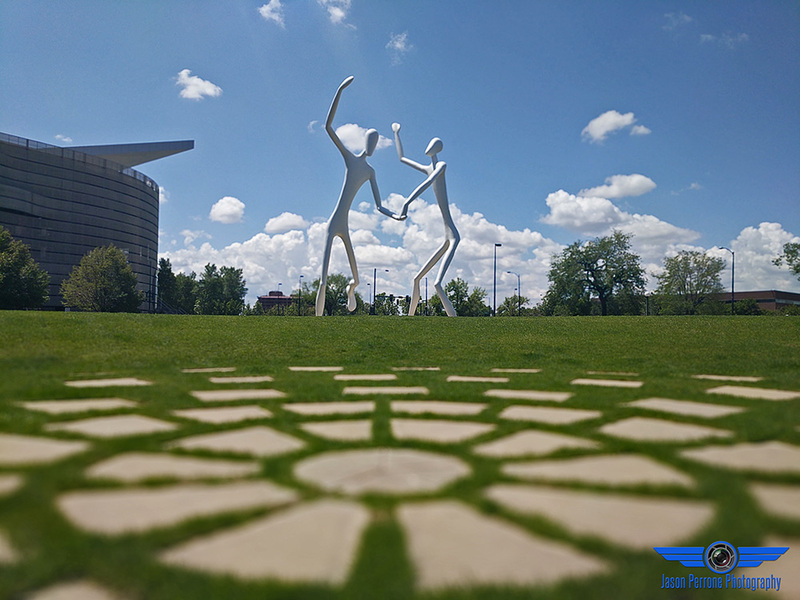 This distinguished area is well known for “The Dancers”, two 50-foot high sculptures located at Speer and Champa. The Sculpture Park is a perfect venue for large outdoor festivals and receptions and hosts many high-profile events including the Shakespeare Festival and American Heart Association’s Heart Walk. Jonathan Borofsky’s Dancers was commissioned in 2003 by the Mayor’s Commission on Art, Culture and Film. Music composed and performed by Borofky and Samuel Conlogue plays at the base of these 60-foot fiberglass and steel dancers and can be heard by visitors to the park. 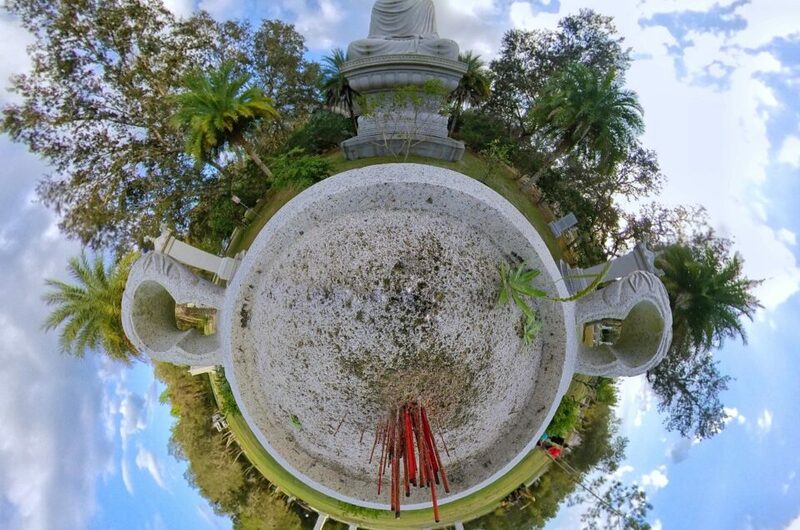 The above video was recorded with the Samsung Gear 360 camera mounted on a monopod.